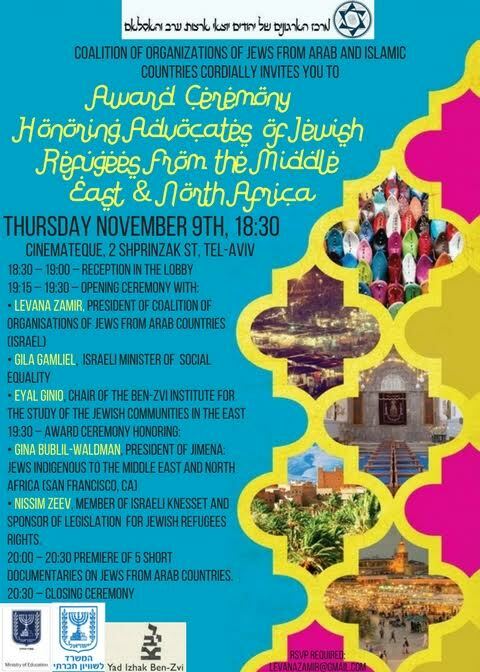 (San Francisco) This November, the Coalition of Organizations of Jews from Arab and Islamic Countries in Israel, will award Gina Bublil-Waldman, with an “Ot Kavod” award, or “Badge of Honor” for her contributions toward the Middle Eastern Jewish-Refugee Justice Movement. The award was initiated in 2016 to honor individuals whose work achieves the promotion of the rights, heritage and history of former Jewish refugees from the Middle East and North Africa. Last year the award was given to Israeli Minister of Social Equality, Gila Gamliel and Professor Uzi Arad, former Head of the National Security Headquarters for the Prime Minister and Founding Director of the Institute for Policy and Strategy at the Interdisciplinary Center Herzliya (IDC). After 9/11, together with Joseph Abdel Wahed, Gina co-founded JIMENA (Jews Indigenous to the Middle East and North Africa) in 2002 to bear witness to the heritage and history of the Jewish refugees from Arab lands. Under her leadership, JIMENA has grown into a leading North American Jewish institution that is educating and engaging over 600,000 people each month on the history and heritage of Jewish refugees from the Middle East and North Africa and their descendants. As JIMENA president and founding, JJAC board member, Gina testified on behalf of Jewish refugees from Arab countries in front of the United Nations Human Rights Council in Geneva, the United States Congressional Human Rights Caucus, the Canadian Parliament, and the Israeli Knesset. Additionally, Gina has shared the story of Jewish refugees from Arab countries at prestigious universities around the world. Levana Zamir, President of the Coalition of Organizations of Jews from Arab and Islamic Countries in Israel remarked that, “The board members of the coalition, decided to give our prestigious “Ot Kavod” award to Gina Bublil-Waldman, for she is currently the greatest of our diaspora advocates fighting for the acknowledgement of the rights, history and heritage Jews from Arab countries. She is being given the award for her energetic work to share and engage our heritage and history with young generations. Gina will accept the award at a ceremony at the Cinemateque in Tel Aviv on Thursday, November 9th. Israeli Member of Knesset, Nissim Zeev will also be honored for sponsoring legislation for Jewish refugees rights in Israel. Levana Zamir, President of the Coalition of Organizations of Jews from Arab Countries will present the award. The evening will also include additional remarks by Eyal Ginio, Chair of the Ben-Zvi Institute for the Study of Jewish Communities in the East and Professor at Hebrew University of Jerusalem, and Minister Gila Gamliel. The evening will conclude with the premier of five short documentaries on Jews from Arab countries. If you are interested in Jews from the Middle East and North Africa, subscribe to receive news updates and hear about relevant upcoming events.